This may change on short haul flights, but not for good. At Aircraft Interiors Expo you can see a new model of a standing seat, the Skyrider seat. It is the third version of the seat combining a very short bottom with the arms and upright back of a regular economy seat. Many airlines have 4 service classes in their cabins: first, business, premium economy and economy class. If they would adopt the Skyrider they would add a 5th service class. This would allow carriers to squeeze even more passengers into their planes. The pitch - the distance between rows - would be reduced to just 23 inches (85.4 cm). Passengers would have a kind of bicycle saddle. Thus, they would be half sitting and half standing. It is certainly not comfortable, to say the least. But it is the dream of Ryanair's boss Michael O’Leary. Currently, airlines cannot install those ’seats’ in their aircraft. The reason is that Airbus and Boeing specify that it is not allowed to install a pitch of less than 28 inches. But they can change that any time they want. 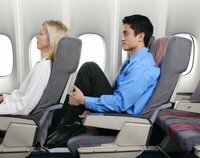 If they would allow a pitch of 23 inches it remains still to be seen whether the US Federal Aviation Administration (FAA) and similar agencies in other countries would allow standing seats. So far, the FAA appears to be very flexible as to the number of seats in aircraft. But if carriers would install standing seats this would raise a safety issue. The number of passengers in a plane would increase considerably. As a result, an emergency evacuation of an aircraft would take more time. Airlines are now required to demonstrate that their aircraft can be evacuated within 90 seconds. It seems questionable whether that will still be feasible if carriers will squeeze considerably more passengers in their planes than they already do. We would not be amazed if the FAA would expand the maximum evacuation time to more than 90 seconds. In that case carriers can increase their load factors. It would impinge on passenger safety. But there are enough passengers who would accept that in exchange for lower ticket prices.